So how did I catch a cold right before I head to Monaco? Not fair does not even begin to cover it. I don't what's worse being sick on a mini holiday or being sick on a 10 hour flight. For this trip I have officially done and currently doing both. I also totally missed my year anniversary of starting this blog. What do these two things have in common? Nothing, other than for some reason I decided to check when I started this blog while waiting for the 10 hour flight that I prayed I would pass out on. Apparently I started the blog on April 25, 2011. So I have been posting for well over a year and no one has kicked me off the net yet. Yay me and stuff. 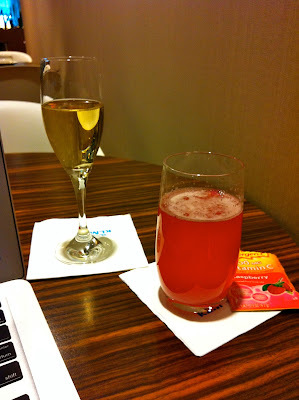 Currently I am making myself feel better by chugging Emergen-C and champagne in the KLM lounge at Schipol and trying to not look the guy across the way in the eye. He keeps looking at me funny and it's starting to give me a complex. The best way to fight a cold is with alcohol, dude. Duh. Maybe next time I will just put the Emergen-C in the champagne and save anyone having to clean an extra glass. You know because I am green like that.